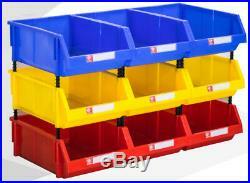 50 Litre Stacking BIG Plastic Open Fronted Recycling Plastic Storage Box Bins! 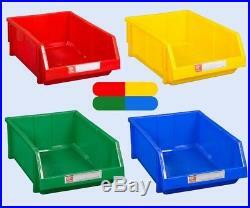 Heavy Strong Order Picking Bins with Drop Scoop Front! The XLSTORE Open Fronted Storage Tower! 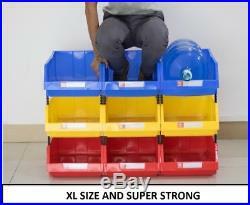 Open Front Stacking Storage Bins with large opening on Front A Brand new 50 Litre Industrial style picking bin Fantastic Quantity Discounts! Ideal for all warehouse picking applications Wide opening allows easy access of contents The XLSTORE Bin can be stacked 6 high providing easy front access to contents Manufactured in recycled grey polypropylene, this helps lower production and sales cost whilst being environmentally friendly Boxes can nest when empty to save space Reference Number: XLSTORE Bin Size (External): Depth 395mm x Width 494mm x Height. 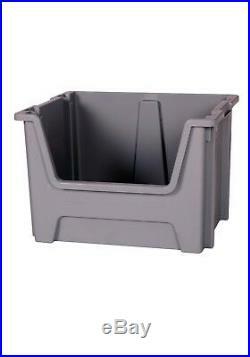 Open Front Stacking Storage Bins with large opening on Front. A Brand new 50 Litre Industrial style picking bin. Ideal for all warehouse picking applications. Wide opening allows easy access of contents. 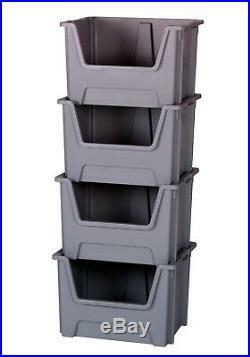 The XLSTORE Bin can be stacked 6 high providing easy front access to contents. Manufactured in recycled grey polypropylene, this helps lower production and sales cost whilst being environmentally friendly. Boxes can nest when empty to save space. Depth 395mm x Width 494mm x Height 320mm. Depth 310mm x Width 395mm x Height 315mm. 1.5 kg each. Home or Business Recycling, Kitchen and Recyclables Segregation, Utility Room, Laundry, Garden Shed, Business Waste Disposal / Sorting, Picking, Storerooms, POS, Dry Solids, Pet Food etc. 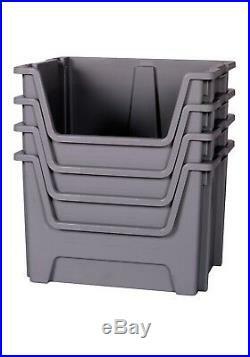 The item “50 Litre Stacking BIG Plastic Open Fronted Recycling Plastic Storage Box Bins” is in sale since Saturday, December 29, 2018. This item is in the category “Home, Furniture & DIY\Storage Solutions\Storage Boxes”. The seller is “solentplastics” and is located in Romsey, Hampshire. This item can be shipped to United Kingdom.